My friend Stephanie posted on Facebook that she was using a spreadsheet to figure out which car to buy. My mind immediately flew to scenarios. Here's an example of how you could use two scenarios to really get serious with pros and cons and the amount of money you'd be spending. Let's say that you're not sure yet which job you'll take, a job with IBM or whether you'll continue to work at home. And you're also considering various cars, and what the cost of ownership will be depending on whether you work at home or have to drive to the IBM site and (in this case, just for fun) pay for parking. Typically, or at least some of the time, you only have one scenario. But I'm showing two in this situation that both affect that big bottom line calculation, just because it shows the power of using them together. Here's the file Download Scenario_start as it is when I start the example, and here's the file Download Scenarios_done finished. First thing you do, set up the spreadsheet with the data for one of the scenarios (a job scenario) and another scenario (a car scenario). So far you're just doing a normal spreadsheet. Put in the data, label it, then do a big complicated field that uses data from all over the spreadsheet to figure out how much it's going to cost, per year, to get the data for the car that's currently showing. Here's how it looks in normal view. Here's a closer look at the big complex Annual Cost of Use field. It brings in all the fields. You've already typed in one version of each scenario but where it gets interesting is overlaying a different version of the data. You're going to do a different version of the job scenario. So select the data (not the label) in one scenario, the job scenario here. In the window, give the scenario the title that you want to be displayed in the spreadsheet, any notes, and select a color. Click OK. You'll see the scenario, exactly the same data but with a dropdown list and the color you gave it. You've saved the first set of data as a set that you can go back to. Now that that set of data is saved, retype a new set. You don't need to do a title here, just retype what the mileage to work would be, parking, and any other changed data, for a different situation: working at home. Now, select that data again as you did last time. Give the scenario a name that you want displayed in the spreadsheet, plus notes optionally, and a different color. Click OK. The new data is saved in this scenario, and of course it affects the bottom line. Now you can switch between the scenario names, and the data you specified for that scenario is displayed. You can keep going as long as you need to--if you have five job offers with five different driving distances and parking costs, you would enter them all. Typically, or at least some of the time, you only have one scenario. But I'm showing two in this situation that both affect that big bottom line calculation, just because it shows the power of using them together. To create multiple scenarios for different cars, you do exactly the same thing. You've already got the first set of data, so select it. Choose Tools > Scenarios and enter a name, notes, and a color, just like before. Click OK. You see the saved scenario with the name you gave it in the window, and the color. Now change the data for what it would be for another car. Select that data, create another scenario like Subaru, Echo, Bike, etc. Click OK when creating it, and you have two different ones to switch between. Create additional car scenarios if necessary, then switch among car and job scenarios to see what the cost of annual ownership of the car would be in each permutation. Note: Deleting the scenario isn't obvious. Here's how. Click the Navigator button or press F5 to bring it up. 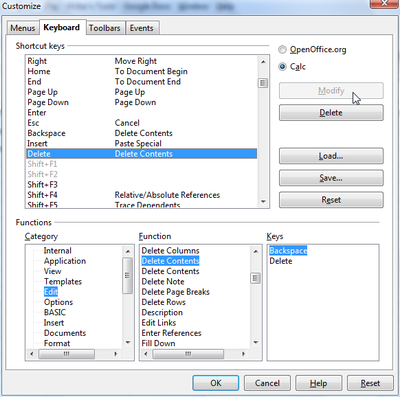 Click the blue-circled Scenarios button, then right-click on the scenario name and choose to delete. Let's say you get a bunch of CSV files exported to you each week, or each month. They're all related so you want them all together in the same sheet so you can analyze them together. 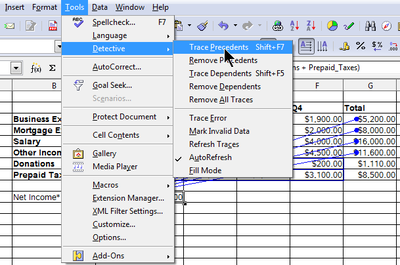 And when you export a new version of CSV file, you'd like that exported data to automatically update the spreadsheet. So if the new amount for account AB-12 is 10,000 in January and 12,000 in February, you want the spreadsheet to show 12,000 when you export the data February 1st. This would be great with Insert > Sheet From File but you can't combine those sheets. So just use either Paste Special or, preferably, basic Sheetname.cellname syntax, in a central "combo sheet" to refer to separate sheets linked to each CSV file. Want more detail? See this PDF. And because I like to be sure that key search terms come up as much as possible, I'm pasting the content in here too. I know the screen shots didn't come up but I want to get this posted so am acknowledging laziness. ;> The screen shots are all in the PDF so just use that; this is just for extra searchability on this topic. You must use the “link” checkbox when bringing in CSVs. You can rename the individual sheets that you bring the individual CSV files into, once you create them, but don’t rename them after you create the combo sheet. The CSV files can be in different directories and can have any names, though I strongly recommend that there be no spaces in the names. 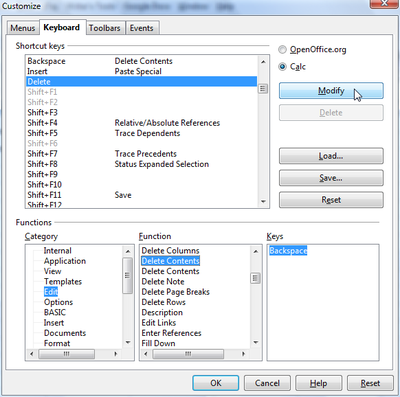 If you want to replace the CSV information that will be brought into the spreadsheet when you export a new CSV, then when you create new CSV files, make sure each new CSV file with updated information has the same file name and is put in the same directory. In a new or existing spreadsheet, follow these steps. Choose Insert > Sheet From File. A window will appear, as well as another on top of it asking you to select a file. Pick the CSV file you want to insert. 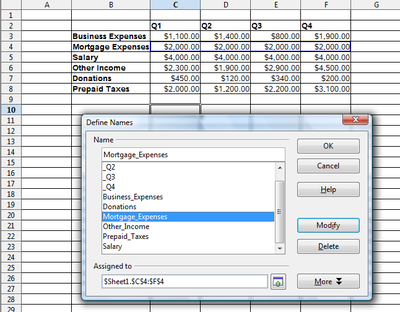 In the next window, you’ll be asked to pick the separator that separates the columns in the CSV file. It’s usually comma but sometimes tab. Usually the program will pick the right one automatically. If it looks good in the bottom part, with the data in columns looking right, then just click OK. 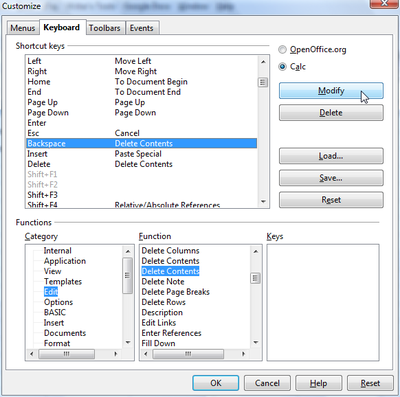 Otherwise select a different checkbox; for instance, uncheck Tab and check Comma. In the window that is now shown, select Link. Nothing else matters since you can drag the sheets around where you want them once they’re created. The data will appear in a new tab in your spreadsheet. If the data in the file changes, the data here changes. To clarify for yourself exactly what data is in this sheet, right-click on the sheet name and choose Rename. Type a new name for the sheet and click OK. Make a note of the name you give the sheet, you will type it in the next step. In the examples, I rename this sheet january_accounts. 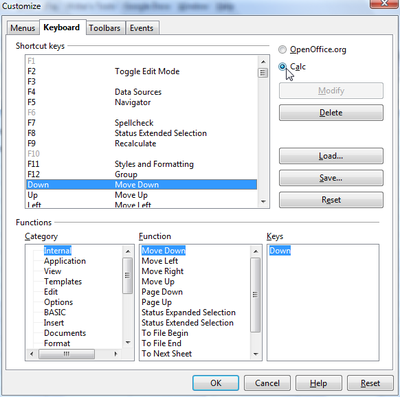 Repeat the steps in this section for each additional CSV file you want in the same spreadsheet. 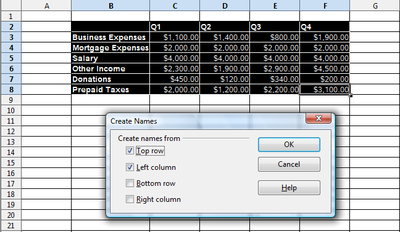 Create or select a sheet to use to combine the sheets. I recommend you name it something distinctive to be sure it’s clear this is the combined sheet. This is different from the procedure in class but addresses the problems that we had with Paste Special. 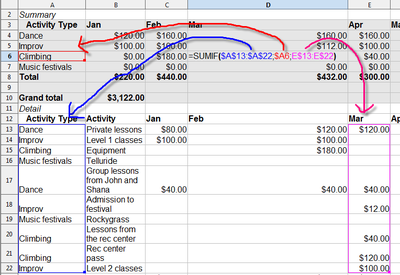 Go to the first sheet that’s linked to a CSV file that you want to put in the combo sheet. Note the sheet name. 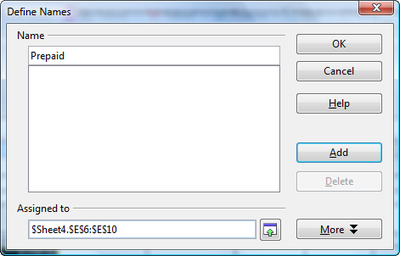 This is the name you gave to it when you renamed it, after importing the CSV file. Also look at the data. How many columns across is it? Does it go to G or to HH? Then note how many rows it has; does it go down to 10 or to 400? Go back to the combo sheet. Click where you want the data to start appearing. Type the name of the sheet, then A.1. and press Enter. The syntax is =sheetname.A.1 and an example is january_accounts.A.1. Once you’ve typed the text from the previous step and pressed Enter, you’ll see the first cell from the sheet you’re bringing in. Now select as many cells as you could possibly need to show all the data from the sheet you’re bringing in. You noted this in the first step. Select from A1 to G100, if necessary, or from A1 to JJ459. To ensure that there is always enough space for the CSV data if there are more rows next time, select a few extra rows, perhaps 10 extra rows for a small sheet or 100 extra rows for an enormous one. Paste: just do a normal paste. 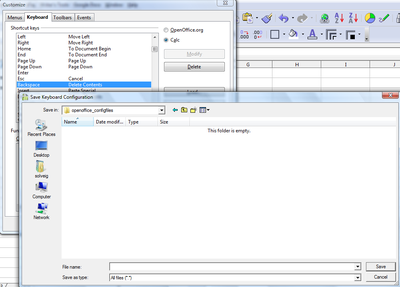 You’ll see something like this, with 0s showing where there is not (currently) any data in the sheet with the CSV file. Now go down farther in the combo sheet to where you want the data from the next CSV file’s sheet to start, and repeat the steps in this section. When you have an enormous spreadsheet, you don't always want to print the whole thing every time. You want to print just a chunk. Also, when you have an enormous spreadsheet, you don't want to have to re-specify, every single time, exactly which range you want to print. So you define named ranges. One called Just Totals, maybe, one called January through March--whatever. Whatever the logical subchunks are that you want to print. How do you easily A) define those ranges with a meaningful name and B) specify which ONE of those you want to print? Choose Insert > Names > Define. Now it shows up in this list. Any additional ranges you define will also show up here. So you're going along, minding your own business, somewhere else in the spreadsheet, and you decide you want to print a range. Select the range name from the list. The range is automatically selected. Select the Selected Cells item. Click Print. You'll only get the selected cells, aka only the ones in that named range. Select the column and choose Data > Text to Columns. This is what the window looks like by default. Now you need to specify at what character you want Calc to go "Hey, time for a new column!" In this case it's the dash. It's not listed so you just deselect Tab, select Other, and type the dash. Then scroll through the data and you'll see how it's going to look if you click OK now. 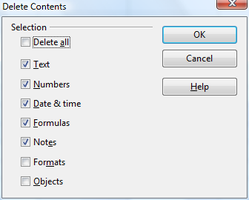 Data > Text to Columns brings up the regular window where, the first time, you specify ) as the separator. You could do it again on the column containing the phone number with the - and split that at the - the same way we split the zip codes earlier in this post. Or just specify both separators, the ) and the - at the same time, and one split will give you three columns. SUMIF() is great for adding different groups of numbers. See http://openoffice.blogs.com/openoffice/2009/08/using-sumif-in-openoffice-calc-spreadsheets-.html for more info on that function. But let's say you want to add up one set of numbers in one case, and another if something else is true. You can use IF to put together two SUMIFs. Here's a basic example. You're putting together a template. Here's the example. So you put together a function, IF K2 is PHP, then sum up the revenue for Bob; otherwise sum up the revenue for James. Here's one with lines from the formula. And this if it's anything else. 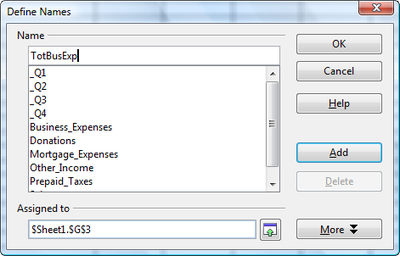 SUMIF(), like other functions, works the same way in Calc as in Excel. However, it's a powerful function that I want to make sure readers know about, if they don't already. 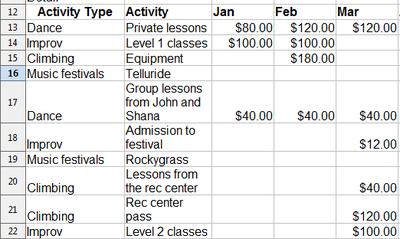 You want to add up all the items that are in one particular category since you want to know how much you're spending on music festivals; how much on climbing related purchases; etc. But the items are entered like this. Not really well categorized. And you don't want to re-sort them to put the categories together because you're always entering new stuff, or you're sharing the spreadsheet--or you just don't want to. 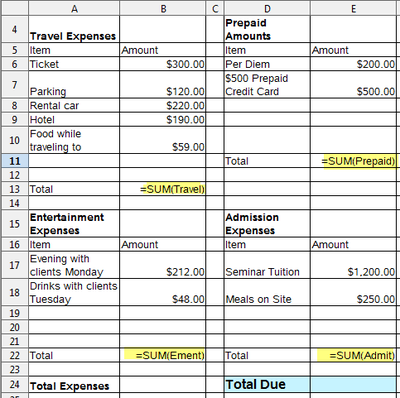 This lets me drag the cell to create the calculation for every summary cell in the summary section. Here's the point where MAX, COUNTIF, data validity, and conditional formatting, come together to tabulate voting results. The project also involves chocolate and squash. I'm throwing an Iron Chef party pretty soon. It's potluck style -- I've designated the "secret" ingredients, squash and chocolate (which need not be used together) and people will bring a dish using one of them. After we eat, we'll vote for the best squash dish, best chocolate dish, best overall, most original, and best imitation of Alton Brown or Chairman Kaga. With up to 30 people coming, though, I don't want to be in my office tabulating paper ballots while the revelry continues in the rest of the house. So I thought to myself, how can I set up a cool (aka geeky) spreadsheet so that people can just type in their votes and the winners will just reveal themselves? I think I'm actually end up going to use a database and a form. 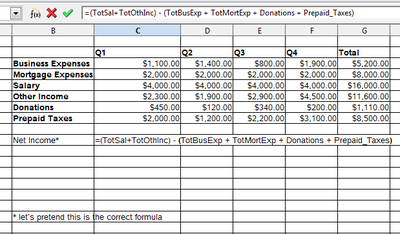 But this is a decent approach too, and the tabulation process (since I don't do a lot of SQL coding) is the same. Here's the situation. I'm condensing it a bit to make it simpler but this is the essential. I've got 10 people coming, and seven people: Bob, Ellen, and others, are actually making dishes. All 10 people need to vote, reasonably anonymously, for the best dish in each of three categories. Each person randomly chooses to vote as Voter1, Voter5, whatever. They choose the person who created the best dish from the dropdown list. That's how we start. How do you create it? Type the Voter1-Voter10, and the headings for the three prizes. Switch to Sheet2 (just to keep Sheet2 clean) and type in all the names of the people who cooked dishes. Now in the first blank cell under the first heading, next to Voter1, choose Data > Validity. You're going to use the Cell List feature to create a dropdown list with whatever values are in the cell range you specify. Use absolute references as shown to refer to the range of cells in Sheet2 that contain the names. The list will look something like this. Use the small black square to drag the dropdown list cell to the other cells that need dropdown lists. You're all set. Now let's say it's party time and people have made their votes. Or at least this is what it would look like. Now let's set up the tabulation. First, bring in the range from Sheet2 so it's easy to see which person got the number of votes. 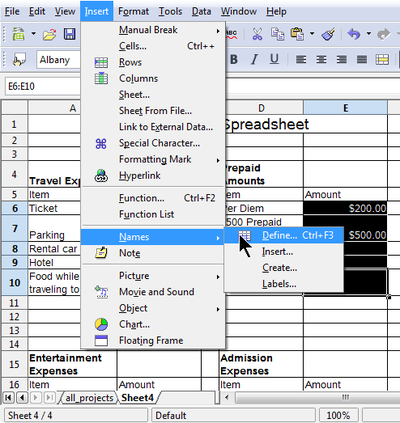 Just type =Sheet2.A1 and drag down. Now you're going to use the =COUNTIF() function to count, for each category/name combination, the number of votes for each member. It's =COUNTIF(RANGE;VALUE) or, for the first one, =COUNTIF(B$2:B$11;$A16) Be sure to use absolute references for some of the values as shown so you can drag the values to save time and effort. Now drag the value down, and over, to fill all the cells for each name/category combination. Now, you'll use the =MAX() function to pull out the biggest number in each column. Now, you can either look for the number that MAX() gives you, to find the winner. That's all you'd need to do once all the guests have voted. Or you could use Conditional Formatting to highlight the number that is equal to the MAX value. Select the first column and choose Format > Conditional Formatting. Set up the window as shown. You're going to make the cell that is equal to the MAX cell formatted using the Heading style. Do the same for the other two columns, referencing the MAX cell corresponding to each. Now that you've got this all set up, you'd just delete the values out of the voting table so it's blank. Then set it up on your laptop at your next Iron Chef party, and let people vote. The totals will automatically be calculated, and the winner for each category (or the people tying for first, as with one of the categories here) will be automatically highlighted. All you have to do is look at the spreadsheet and pass out the prizes.